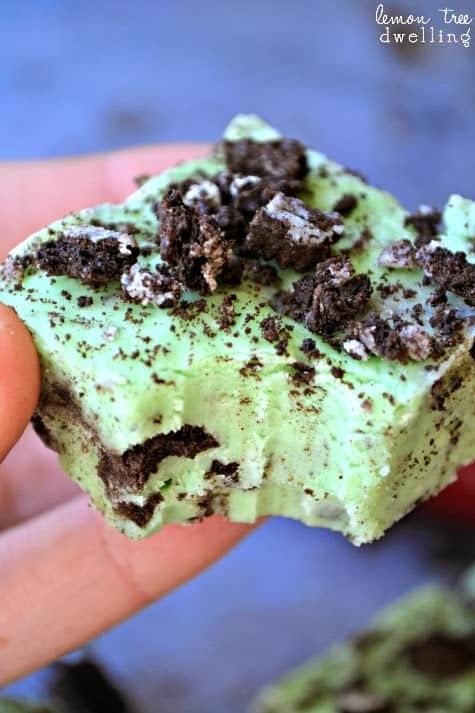 Mint Oreo Fudge is a quick and easy dessert ready to share with others. 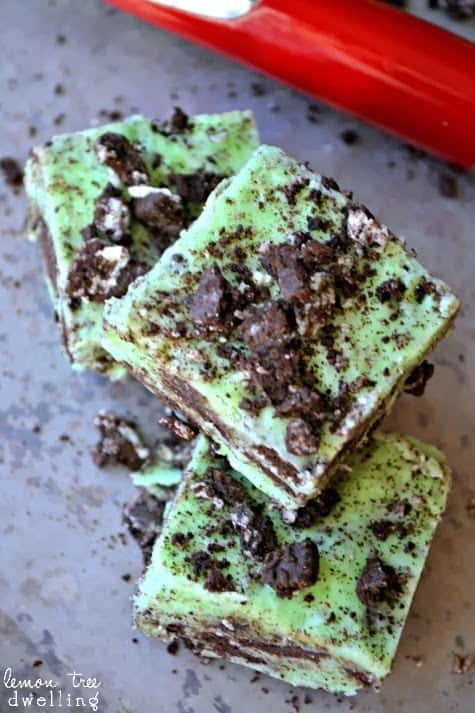 This 5 minute, no-bake treat is a rich and creamy peppermint fudge filled and sprinkled with chocolatey Oreo cookies. Your new favorite holiday treat! In case you haven’t noticed, I’m kind of into no-bake treats. 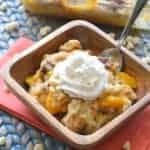 Okay….I’m sure you’ve noticed….since this is somewhere around the 30th no-bake recipe I’m sharing! I hope you don’t mind. 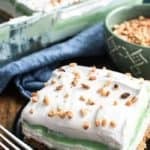 There’s just so much to love about no-bake baking! Not totally convinced? 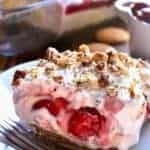 Let me share with you all the reasons why no-baking is definitely the way to go….at least half the time. 1. It’s quick. You are cutting out the baking time! 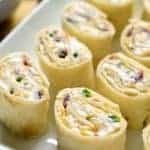 Typically, no-bake recipes involve a little mixing, a little melting, a little dipping or drizzling, and a little time to set. Of course, sometimes the melting doesn’t go smoothly, the dipping takes longer than expected, or things don’t set quite the way you had hoped. But. 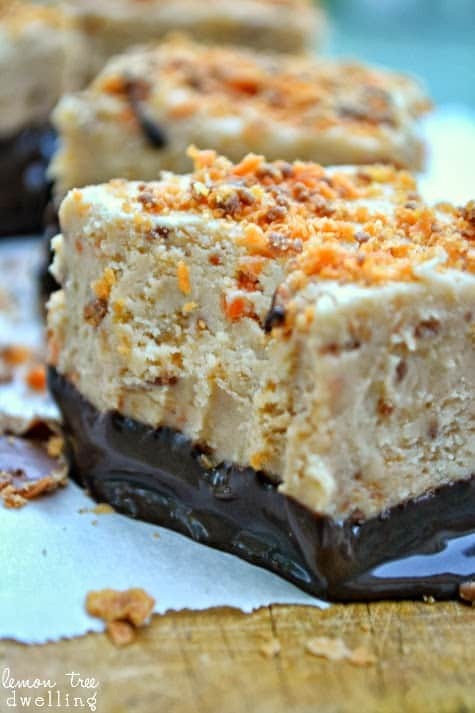 The more you do it, the more you avoid these no-bake pitfalls! And the quicker it is. #2. It’s fun. You can experiment! Even my kids can (and do) come up with their own no-bake recipes. There are no rules like there are in baking….so you can really let your creativity fly! Of course, there are some things that don’t really work, like mixing white chocolate with half the things you might be interested in mixing it with, but you learn as you go. And you have fun with it! #4. It works all year round. It’s not weather dependent! How often do you find yourself unwilling to bake in the summertime because of the added heat from your oven? No baking, though? No excuses! #5. It lasts. Last, but definitely not least, no-baked treats last so much longer than baked goods. They don’t spoil! At least not nearly as quickly…which makes them IDEAL for holiday gift giving. A plate of cookies should be eaten within a few days. 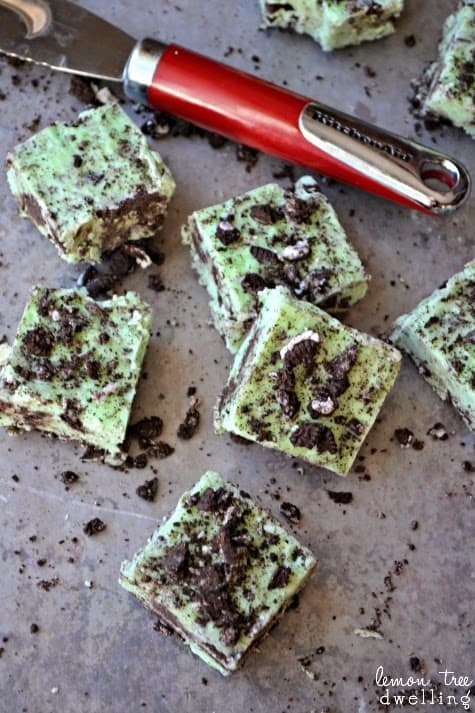 But a plate of this No-Bake Mint Oreo Fudge could last weeks! 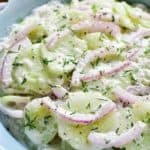 Not that it ever would….with how delicious it is…..! 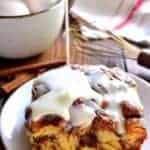 Mix cream cheese, butter, powdered sugar, and dry milk together with hands. Add peppermint extract and green food coloring and continue mixing to incorporate. Mix in approx. 20 Oreo cookies, broken into large chunks. Press mixture into buttered 9x13 inch pan and top with remaining Oreo cookies, finely crushed. *For extra crunch, top just before serving. Cut in squares; store in refrigerator. Need a mint cocktail to enjoy? Nothing beats a fresh Mojito! 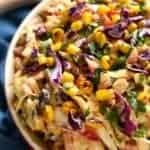 Try this one from All Recipes. 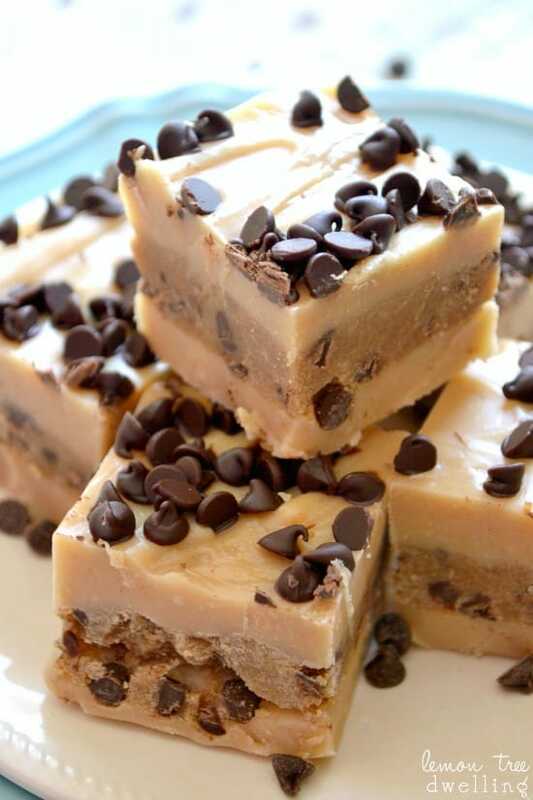 I love an easy, no bake recipe and since it’s almost fudge season, this one looks like the perfect one. Yummy! I love the color too – maybe a teacher gift in the future! 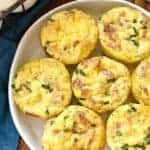 You really can’t go wrong with a recipe like this, can you? 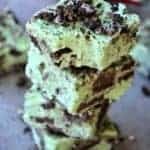 No bake and made with oreos? Win-win! My brother in law loves oreos so I think I’ll make a batch for part of his christmas present. Thank you for sharing! 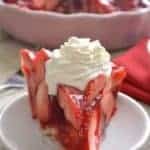 I am thoroughly enjoying your No Bake treats Cathy!! Keep em coming! I love the Oreo mint combo, just perfect for the holidays! Although I’m not sure these will last that long, we will devour them! I’ve never made anything like this before! I have to try it. 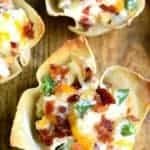 I know my boys would love me if I made this!!! Pinning! Oh, that sounds SO delicous, Cathy!! Found you through TT & J. That looks delicious! 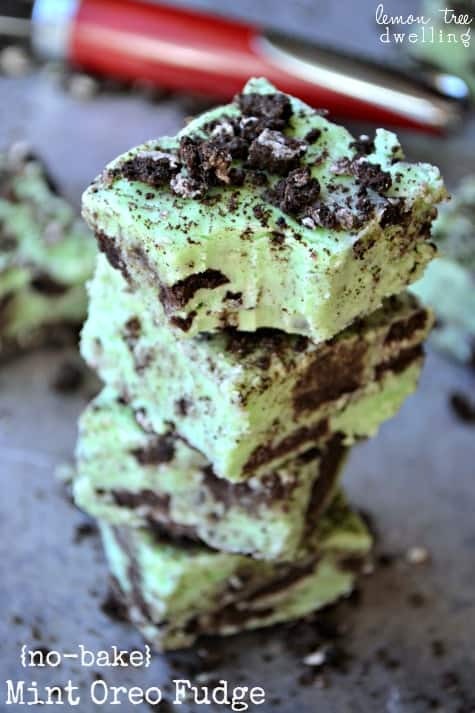 We love the mint/Oreo flavor combo in this house, & this fudge looks perfect! Love that there is no cooking too. Just made this for Christmas! It went well! SUPER EASY–hands are just tired from mixing. Unfortunately, the scent of the dry milk was unexpectedly awful to my nose… I’m not sure if I’m going to be able to taste it now! It looks so good too… Just my luck! Thanks for sharing! Merry Christmas!